The Congregation for the Propagation of Faith erected the Prefecture of Tibet Hindustan in 1703 and entrusted it to the Capuchin Fathers of the Italian Province of Pinenum in the Marches of Ancoa. The first group of missionaries reached Lhasa (Tibet) in 1707 and began a mission there. For nearly 41 years the Capuchin Missionaries worked in Lhasa until a religious persecution forced them to give up their mission and move to Kathmandu (Nepal) in 1745. Nepal had seen the Capuchin Missionaries working with varying success in Kathmandu since 1715. A new conqueror of Kathmandu valley, Raja Pritvi Narayan, who was not sympathetic to the missionaries, stopped all support to them. The Mission of Nepal was also abandoned in 1769, and the missionaries with 62 Nepalese Christians and five catechumens moved to India. The Nepalese Christians and catechumens settled down at Chuhari near Bettiah. The scene of the Capuchin Mission shifted now to the Indian soil. Father Joseph Mary, OFM Cap., a saintly priest founded the Bettiah Mission in 1745, after the King of Bettiah, Raja Druva Singh had obtained permission from Pope Benedict XIV. Rome erected the Prefecture of Tibet-Hindustan into a Vicariate in 1812. In 1827 an independent Patna Vicariate was created, comprising of Bettiah, Chuhari, Patna City, Danapur, Bhagalpur, Darjeeling, Sikkim, Nepal and adjacent territories. The saintly Anastasius Hartmann, OFM Cap., was appointed its first Vicar Apostolic. With a Decree of Pope Leo XIII Patna Vicariate became a part of Allahabad Diocese in 1886. The North Bihar Mission with its four stations of Bettiah, Chuhari, Chakhani and Latonah was entrusted to the Tyrolese Capuchins in 1886. In May 1892 the North Bihar Mission was made Bettiah-Nepal Prefecture with Fr. Hilanon of Abtei, OFM Cap. as its first Prefect. In 1919 this Prefecture was dissolved and joined to South Bihar to form the present Diocese of Patna. Pope Benedict XV by a Decree on September 10, 1919 divided the Diocese of Allahabad into two. The Diocese of Patna was thus created. The Prefecture of Bettiah-Nepal was annexed to the new Diocese. The Holy See entrusted Patna diocese to American Missouri Province of the Society of Jesus. Later on November 13, 1930, after the division of Missouri Province, Patna Diocese was entrusted to the Chicago Province of the Society of Jesus. Louis Van Hoeck, S.J. was ordained the first Bishop of Patna on March 1921. The Third Order Regular (T.O.R.) Franciscan Fathers from Pennsylvania, U.S.A. came to Patna Diocese t assist the Jesuits in 1938. The mission stations of Bhagalpur, Gokhla, Poreyahat and Godda were assigned to them. In 1956 Bhagalpur was made a Prefecture and in 1965 it was created a Diocese with Msgr. Urban Me Garry, T.O.R. as its first Bishop. The forbidden Kingdom of Nepal was once again open for missionaries in 1951. Thanks to the efforts of Fr. Marshall Moran, S.J. Nepal was made an independent ecclesiastical unit in 1984 and Fr. Antonym Sharma, S.J. was appointed as its first Mission Superior. On March 28, 1980, Pope John Paul II accepted the resignation of Bishop Augustine Wildermuth, S.J. and divided the Patna Diocese into two units, Patna and Muzaffarpur. Fr. Benedict J. Osta, S.J. was appointed Bishop of Patna, and Fr. John Baptist Thakur, S.J. as Bishop of Muzaffarpur. In the year 1999, Patna Diocese was elevated into an Archdiocese. Late Archbishop Benedict J. Osta, SJ, became the first Archbishop of Patna. In 2005, Pope Benedict XVI divided Patna Archdiocese and created Buxar Diocese and Most Rev. William D’souza S.J. became first bishop of Buxar. In 2007 Most Rev. William D’Souza, S.J. 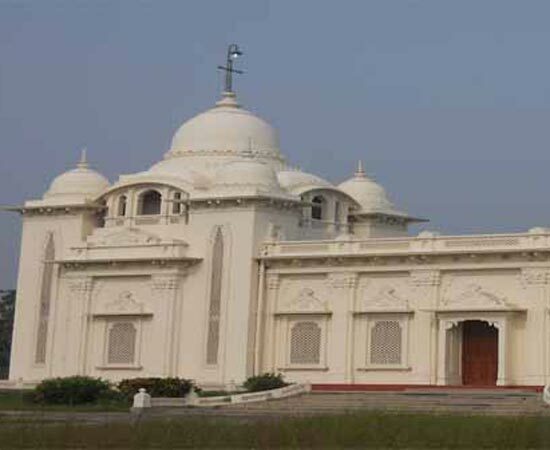 of Buxar diocese was elevated as the Archbishop of Patna. On 29th June, 2018, Most Rev. Sebastain Kallupura, the Bishop of Buxar was appointed as the Coadjutor of Patna Archdiocese. The Archdiocese of Patna has an area of 25,821 Sq.km. It has 11 civil administrative districts of the State of Bihar having a population of approximately 17,846,487. Its Catholic population is 57,602. Patna is the centre of activities of religious founders like Budha, Mahavir Jain, Sikh Guru Govind Singh. The Archdiocese has altogether 35 mission stations and parishes spread over 11 civil districts of Bihar State. Out of 35 parishes, and mission stations, 29 are rural where the majority of our Catholics approximately 48 thousands live. These Catholics are from Harijan (Dalit) community. The rest of the Catholics are from other Christian community generally known as Bettiah Christians and from tribal group.